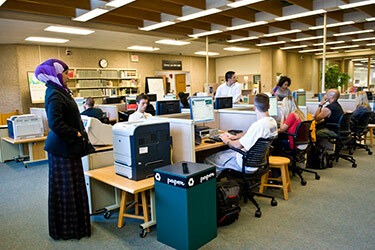 PrintWright is a pay-for-print service provided for students and guests of Wright State who are using public workstations and laptops running Microsoft Windows or Macintosh OS X operating systems. Please note: laptops must be able to connect to a wireless network, and users must connect to one of the Wright State wireless signals in order to use the PrintWright system. Also, users must have a Wright1 Card with money deposited in the Raider Cash account to purchase their printed documents. The PrintWright service does not include any printers located in office areas. If you need to print to one of those, please use the Managed Print Service on the Division of Business and Finance website. Windows Users: If using a laptop, connect to a Wright State wireless connection. You will not be able to use the PrintWright system unless you are connected to a Wright State signal. Next, download and install the Microsoft Windows Printer Client before attempting to install a printer. If you click on a printer link first, the Windows client will download to your computer, but the printer will not install. Mac Users: If using a laptop, connect to a Wright State wireless connection. You will not be able to use the PrintWright system unless you are connected to a Wright State signal. Go to the website printwright.wright.edu. Now you can simply click on a printer to download and install the .DMG installation file (Macs do not require the installation of software). Windows Users only: After installing the Windows client, visit the List of PrintWright Printers website and click on the printer you want to install. Printing is available only at the PrintWright locations listed and normal PrintWright charges are incurred. If you have difficulty, please contact the CaTS Help Desk by calling (937) 775-4827 or sending email to helpdesk@wright.edu. Advancements in wireless technology have introduced many printer models that support wireless printing. This technology can be very convenient to use, especially in areas where wired connections are not available. In order to maintain a required level availability of services and confidentiality of sensitive data, the following guidelines apply to wireless printing on campus. The wireless device must not interfere with any WSU wireless network, interfere with other private networks already approved, or interfere with other wireless printers previously approved. The use of this printer shall not violate any University Policies, including policies from the Department of Printing Services and CaTS. Wireless printing is not intended for the printing of sensitive data such as Social Security Numbers, Credit Cards, or other confidential information. A printer can be configured as a wireless device or wired but not both. Security patches and firmware updates should be applied in a timely manner. Faculty may seek exception to the above policy by filling out a non-standard equipment Exception Request form. I don't have a Wright1 Card with money deposited in the flex dollars account. Can I still use PrintWright? Yes, there are a couple of possible solutions that will allow you to use the PrintWright system. If you are a guest and don't have a Wright1 Card, you can purchase a PrintWright card from the circulation desk of the Paul Laurence Dunbar Library during the library's normal hours of operation. If you have a Wright1 Card but no money in the flex account, you can add money to your card. Find instructions for this on the Wright1 Card FAQs page. I am a FIRST TIME user of the PrintWright system. Is there anything special I need to do? If you are first time user to the new PrintWright system, you will need to install the client for Microsoft Windows on your Windows-based computer before selecting a printer to install. If you are using a Mac, you can simply click on the printer name to download the printer installation file. How do I delete the printer clients from my computer? How do I release a print job once I have submitted it to the PrintWright system? Once you have submitted your print job, you should visit the printing location that you selected during the installation process. Swipe your Wright1 card at the release station and then select your print job from the list to verify the cost of the print job. Once you have highlighted your job and verified that the cost is accurate, press the print button in the bottom left corner and your job will be released. If you don’t see your job press the REFRESH button in the top left of the screen to obtain an updated list of jobs. What if I don't see my job listed? If you have refreshed the list and still do not see your job on the list, make sure that you have selected the proper location and that you are looking for either your document title or the username you have used to log in to your computer. How much does it cost to print using the PrintWright system?